So it turns out that a lot of you like Karson's possessed, creepy, scary, pirahna face. So here is the second picture we took on his birthday- Kregg thinks this one is creepier. I had an ultrasound yesterday and of course this little spitfire in my belly was jumping all over the place and shooting me peace signs. That's always good. Then today I had my appointment today, and he told me that the placenta has moved up and that it isn't even an issue anymore. He has no idea, though, why I am still bleeding. So he told me to go ahead and get back to my life (except that Kregg still can't look at me funny...), and just take it easy if I'm cramping or what not. So I have a little bit of freedom back! Yay!! It also looks like Kregg is going to take the store in St. George. We are waiting for the final details with Ace Hardware, so we will still be around if it works out. The part that Kregg is not looking forward to is the time change in St. George. If he has to be there at 7am, that is 6am our time. Which means he has to leave at 5am our time, which means he will have to wake up at 4 or 4:30 in the morning. That ought to be pretty entertaining. But he's not looking for it to be long term out there- and if it is our lease will be up in June and we'll move up there. We will probably still have the option of being able to go up to California if things don't work out. Hopefully everything will go the way we are planning! Anyway- on a really great note- my sister and her friend Monika decided to surprise me today by showing up on my doorstep from SL. So we're going to play tonight! I'm stoked!!!!! 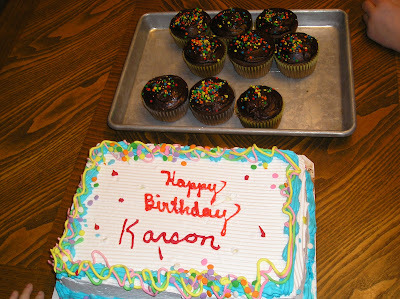 Karson helped our friend Keri make those cupcakes. Way yummy! You all know about the "Clemens' Scowl" that Karson pulls off so well. 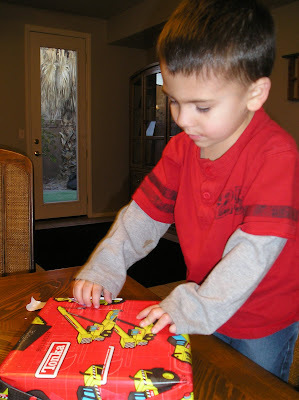 Ty also got this game for Christmas where whoever has the best "pirahna" face gets to go first. 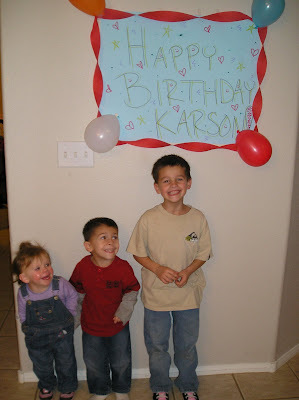 Karson always wins hands down. This picture is just downright freaky. 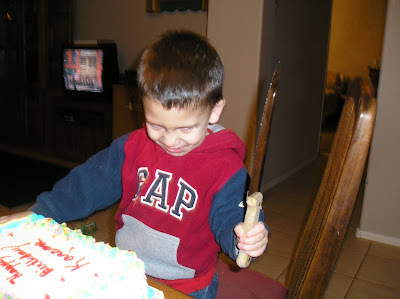 I hope we aren't raising a serial killer! 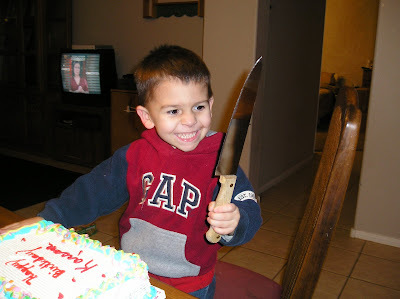 I think we are the psychos giving a 4 year old a knife just to take a picture. He was so proud! 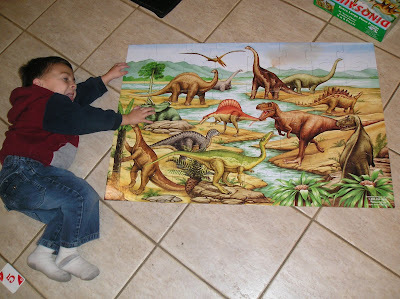 He put together this puzzle all by himself! I'm very impressed! Thanks Grandma LeFevre! 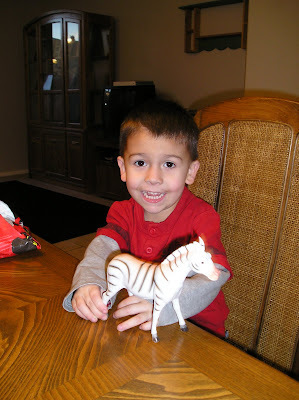 He loved all his gifts- but this zebra takes the cake. Funny how a 99 cent toy does that. 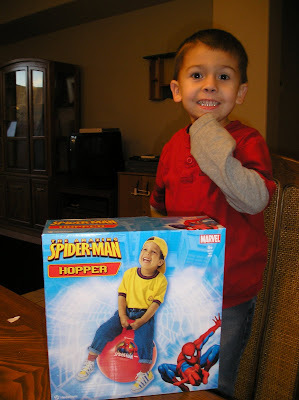 I can't believe he's 4! He is such a good kid. He is a great helper, he's smart, stinkin' hilarious, and he is always trying to make "good choices". We are so proud of him, and definitely blessed to have him as part of our family! We love you Kars! So I know that this is annoying- but I ended up back in the emergency room today for more bleeding. But we heard the baby's heartbeat, so he (oh I mean "it") is still going strong! They called it another "close-call miscarriage". So here I am- still having to do nothing. I actually like all of the extra rest- but I never realized how much I appreciate doing even just the little things! Kregg has been so great. 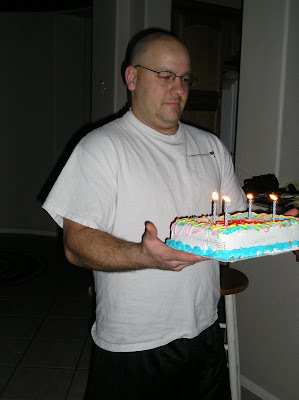 He has all this stuff going on with his job, yet he still comes home and takes care of me and the kids. He's done all the laundry and the dishes, and even gets me drinks when I want one! My Ward has also been AMAZING. We have gotten dinner (and even some lunches) all week. 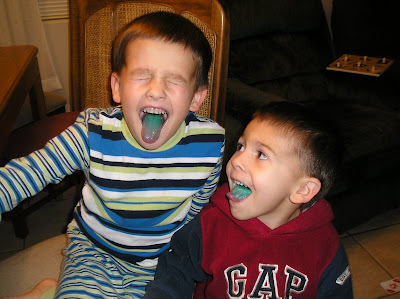 My friend Keri has taken my kids all week until Kregg gets home. My friend Michelle even came over and cleaned! We've also had lots of phone calls and visitors. I can't even explain to you how grateful we are for all of this. We are in awe that so many people go so much out of their way for us!!! Makes me cry just writing about it! Kregg is still waiting to hear from Walgreens on his future. His inventory is in less than 2 weeks, so we are starting to get a little bit concerned. But the big region guy from Rite Aid is coming out next Wednesday to give Kregg their offer. The general manager of Smith's came to visit Kregg yesterday about offering him a job with them, and there are a few other options that we might have. But for right now- we are just waiting!!!! Okay- so let's get onto brighter pastures... we had Ty's first parent-teacher conferences yesterday. He's doing a really great job! He's always the first to raise his hand, always sitting in the front, and always has lots of questions (surprise). We're really proud of him. Karson was really excited to start preschool back up. They are learning about planets this month. He and his dad get to work together to come up with a few things about Saturn so he can share with the class. He also started Sunbeams, and they sang to him for his birthday. So I'm sure he is going to like it. Went to the Doc today! So I had my appointment today- they did another ultrasound and the baby is still kicking and heart is beating. I'm not bleeding anymore- so that's good, too. I guess that my placenta is right on my cervix, so they said that I probably will bleed again, and when I do, go to the ER again. Annoying, huh? Sometimes it fixes itself, but if it doesn't then I'll have to have a cesarean. There is still a chance of a miscarriage, but it looks better than it did. He did take me off of bedrest, and put me on "light". He also told me to make sure my husband doesn't look at me funny, and come back next week for another ultrasound. Kregg hasn't heard anything on his situation, although he's left a message for the Walgreens district manager and should hear his offer from Rite-Aid hopefully tomorrow.Anyway- thanks for all of your support- it's been amazing! It makes this whole thing a lot more managable! Hey everyone! Just wanted to give everyone a heads up on the last 2 days here... Yesterday we found out that Rite-Aid has sold all of the stores in Nevada. Some in Vegas are going to a small grocery store, some are being bought by Walgreens, and some are closing. Kregg's store is being sold to Walgreens. His inventory is in 3 weeks, then they shut down the store for a month and open it up as a Walgreens. We have a couple options: he will have an interview with Walgreens, but they usually bring in their own management. Rite-Aid is talking about transferring him to Northern California and giving him an extra $20,000 (we'll find out more about that on Monday hopefully). Or he could try looking for another job, but there really isn't anything here in Mesquite. I'll keep you posted on what we decide to do. If we decide on CA, Kregg will probably be out of here in 3 weeks to find us a place. It will happen pretty fast. Also today we spent all day in the emergency room- I've been having some heavy bleeding. But as of right now the baby is doing good- heart beat is good, and he was like a little jumping bean in my belly. But they did put me on bed rest (since I'm still bleeding), and I have to go see the doc on Monday. So your prayers would be appreciated!